I've had the honor of being asked to be part of Promises and Pearls this year. This is a fabulous event put on Michelle of MB Wedding Designs & Events and Bev of Especially Yours Chair Covers. 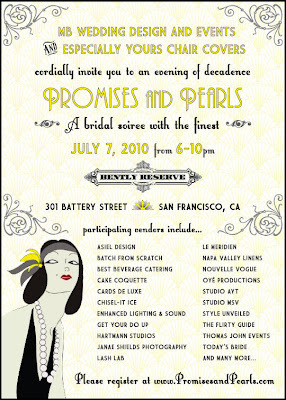 This is an evening of decadence and will be a bridal soiree with the finest. They've gathered a fabulous group of vendors and I'm so excited to be part of it! Come join us on July 7th from 6-10pm at the Bently Reserve. The invitation is below but let me know if you would like more information!